We like data. So today, here’s some data on the state of the container industry just before the industry’s biggest event of the year: DockerCon. You can read the full report and even look at the raw data if you want to get out your calculator and do some serious number crunching. The Portworx Annual Container Adoption survey was distributed in March 2017 and includes insights from 491 IT pros across a variety of industries and company sizes. It asked questions about the state of container usage, tooling, environments and barriers to adoption to get a snapshot of container adoption today. The 2017 survey asked many of the same questions included in a previous Portworx survey and the container survey distributed in 2015 and 2016 by ClusterHQ before that company closed its doors.This creates a multi-year dataset that we can use to draw conclusions on how container adoption has changed over time. 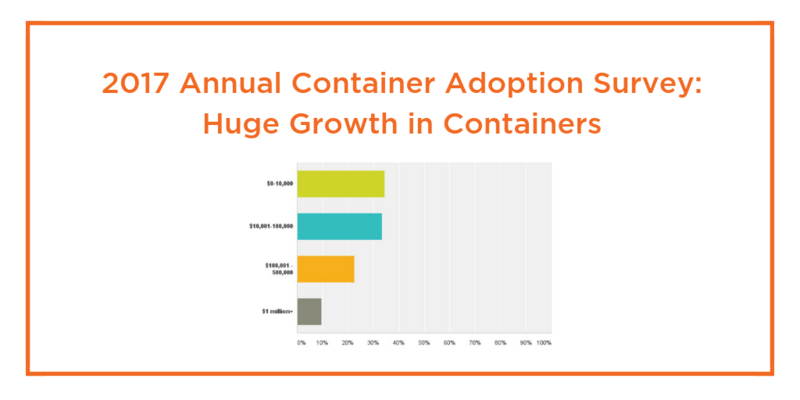 The survey results indicate that containers continue to grow in relevance with 32% of companies spending $500,000 or more a year on license and usage fees for container technologies, up from a reported 5% last year. This huge increase in IT spend is an indication that container market leaders are taking advantage of interest in containerized workloads. As container adoption proceeds at a fast pace, some of the challenges of years past remain, while others appear to have been largely addressed. For two years running, persistent storage is the #1 challenge for running containers, with 26% of the sample identifying persistent storage as the most difficult challenge to overcome. Given that most companies have started moving the stateless parts of their applications to containers first, it makes sense that they are still investing solutions for stateful services as they increase their container adoption. In order to deploy containers, which challenge has been the most difficult to overcome? In previous years, security and networking have rounded out the top three challenges identified in the survey, but this year, neither are in the top three, with only 10% of the sample indicating that networking is the top challenge and 7% of the sample saying security is the top challenge. This is somewhat surprising given the intense debate both of these topics have generated in previous years. But with Docker and Kubernetes offering a number of pluggable networking and security options, it appears that more and more of the industry is feeling good about their ability to securely run multi-node container deployments. In 2017, in addition to persistent storage, the other top challenges included data management (13%) and multi-cloud or cross-datacenter support (10%). 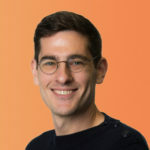 The multi-datacenter problem is interesting because it indicates that companies are taking up containers on their promise of application portability, but struggling to make it a reality. One area of intense focus within the community is orchestration tools. This year’s survey makes it clear that there is no winner yet in the race to provide the best container management solution. In fact, it appears that customers are still trying multiple solutions. While Kubernetes is the most popular scheduler, it may be another year or more before we can draw concrete conclusions about winners, with a likely outcome being that customers use multiple tools for different jobs. Which container orchestration tools does your organization use most frequently? Sixty-nine percent of respondents with knowledge of their company’s financial investments said their company is making an investment in containers. That percentage is up from 52% in 2016. Of these companies, 10% are making over a million dollar investment in license and usage fees for containers, more than doubling between 2016 and 2017 when the percentage was only 4%. Thirty-two percent of the sample was spending more than $500,000 per year, up from 5% in 2016. Increases in spending for personnel to use container technologies also increased at similar rates, with companies investing more than $1 million in personnel, rising from 6.5% in 2016 to 13% in 2017. Companies spending more than $500,000 per year went from 13% in 2016 to 38% in 2017. Persistent storage is the #1 challenge for running containers, two years running, with 26% of the sample identifying persistent storage as the most difficult challenge to overcome. In previous years, security and networking have rounded out the top three challenges identified in the survey, but this year, neither are in the top three, with only 10% of the sample indicating that networking is the top challenge and 7% of the sample saying Security is the top challenge. In 2017, the other top challenges included data management (13%) and multi-cloud or cross-datacenter support (10%). This last challenge is interesting, indicating that companies are taking up containers on their promise of application portability, but struggling to make it a reality. When asked about the storage challenges users have experienced, 46% of the sample stated that they lacked adequate tools for managing container storage and 39% of the sample had concerns about data loss, echoing the concerns people have about persistent storage in general. Twenty-six percent of respondents complained that storage does not effectively scale with number of containers. 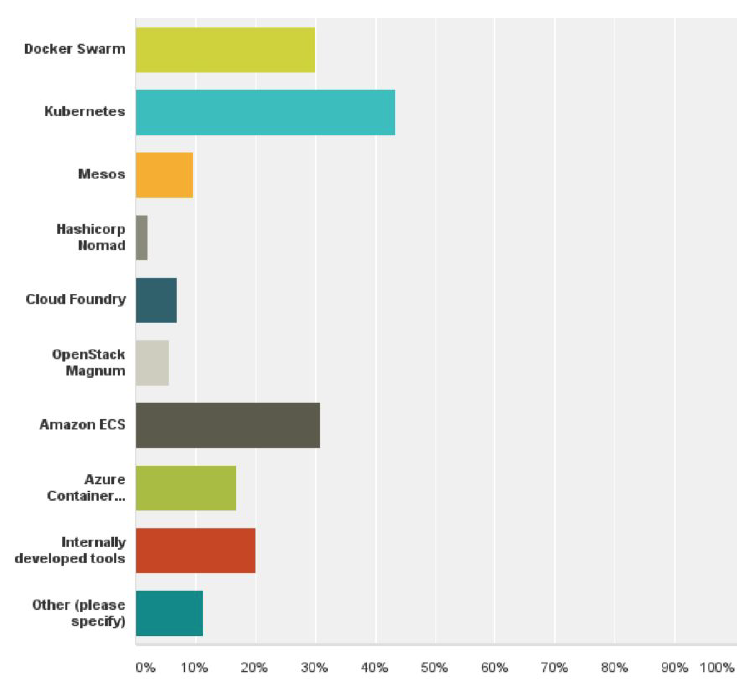 Kubernetes is the most widely used orchestration tool, with 43% of respondents saying they used Kubernetes and 32% saying that it is their primary orchestration tool. This is an increase from last year, when Kubernetes was the primary tool of only 27% of the sample. 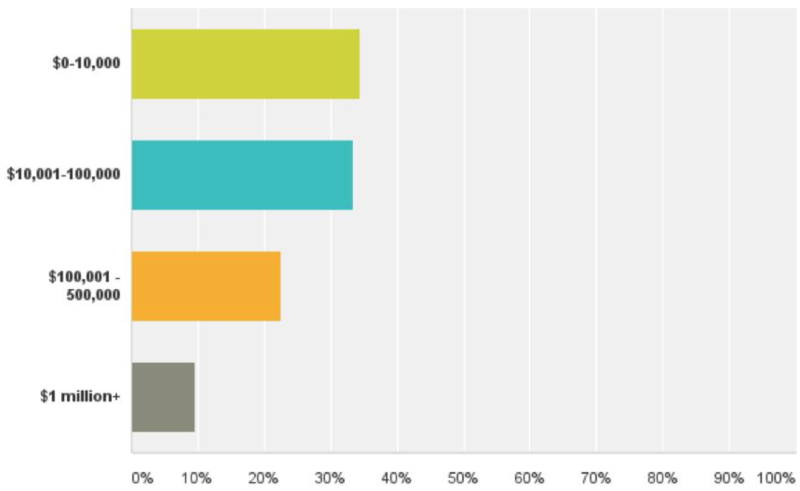 However, 32% of Kubernetes users also say they are using Docker Swarm, so it appears that many businesses have not made their final orchestration decision. For companies with more than 5000 employees, Kubernetes is used by 48% and the primary orchestration tool for 33%. One of the more surprising findings in this year’s survey is how quickly AWS ECS is coming up in the orchestration market. Thirty-one percent of respondents say they are using ECS (up from 21% in 2016), with 12% saying it is their primary orchestration tool (up from 10%) . 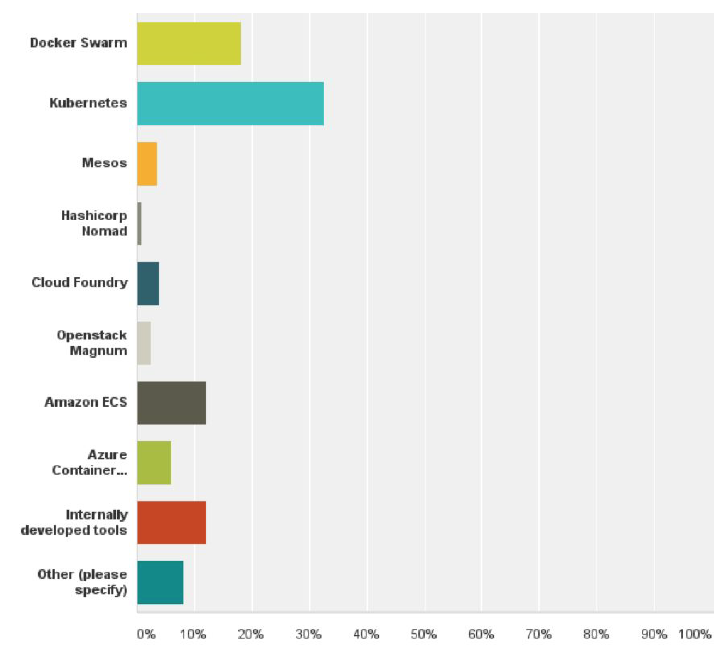 However, most people seem to be experimenting, with 46% of ECS users also using Kubernetes and 35% also using Docker Swarm. For companies with more than 5000 employees, ECS is used by 37% and the primary orchestration tool for 15%. Seventy-nine percent of the sample chose Docker as their primary container technology, demonstrating that the Docker Engine project continues to be synonymous with containers. Swarm also continues to be a popular orchestration choice. Thirty percent of the sample said they are using Docker Swarm, with 18% saying it is their primary scheduler. This is roughly in line with last year’s survey, with 29% using it and 19% saying it is their primary. For companies with more than 5000 employees, Swarm is used by 32% and the primary orchestration tool for 15%. In 2017, nearly one-third of the sample, or 29%, said they were running containers on Windows, up from only 9% in 2016. This indicates that Docker’s investment in the Microsoft ecosystem is paying off fast. 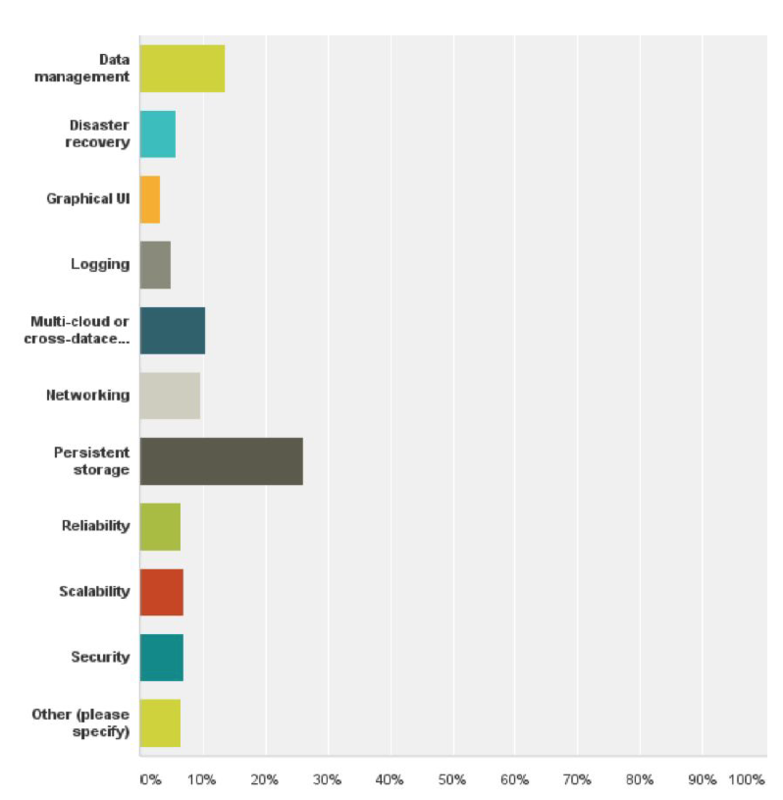 Portworx Survey: What Do Container Users Want from Storage?